Michele Abbate debuts here race spec 2013 Scion FRS at during the US Touring Car Championship (USTCC) held at Laguna Seca on June 28-29 2014. We (Delicious Tuning) were incredibly excited to see her get out on the track and qualify for the race on Sunday and then proceed to finish the race ahead of her close competitors with a consistent, reliable and well setup vehicle. 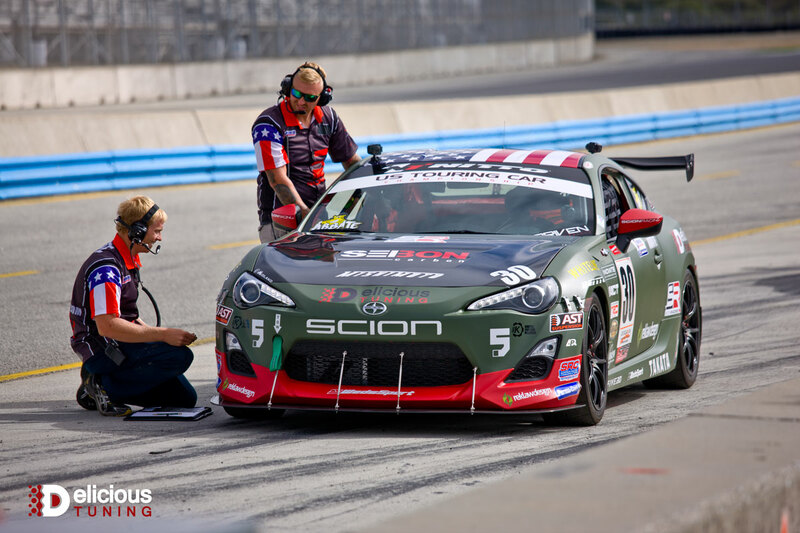 A little extra work can go a long way and I would like to congratulate Michele and her team on a well-deserved finish for a first time showing of her vehicle in the USTCC. Michele Abbate on the back stretch after the Cork Screw at Laguna Seca. Delicious Tuning would like to thank those sponsors that were able to come in at a moment’s notice to get this project off the rack and onto the track. Without the help and support of our friends over at Airaid, JDL Designs, Innovate Motorsports and AST (Mann Engineering) this would not have been possible.